Hello, we are so stinkin' excited to introduce Unicorns and Rainbows today. I've been having wayyyyy too much fun with this set! I was so smitten with this set that I got a jump start on using it months ago in November when I needed a last minute birthday card for a special little girl. 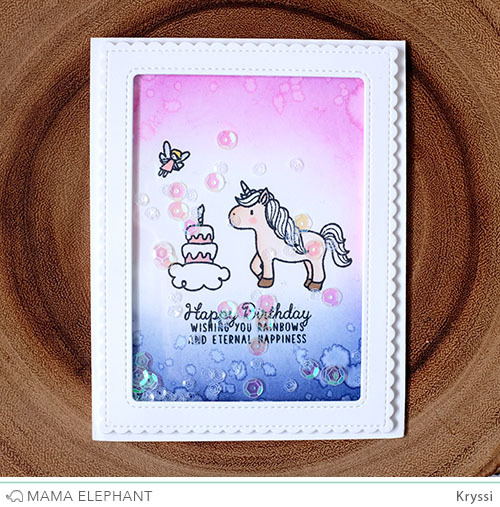 Yes, I have stacks and stacks of already made cards, but I wanted something super special and unique and I just knew that Unicorns and Rainbows had all those elements to help me make the perfect card for the little girl! This was so easy with the help of Framed Tags - Madison Avenue, which has become a staple on my desk. You will see me overuse this a lot! Just some basic stamping, coloring and quick assembly and this card was done in about 10 minutes! Now months later, I came back to this set to create some projects for today's post and challenged myself to use pretty much the same elements from the first card. This is what I came up with using our new Rainbow High Creative Cuts die set as well. The sentiment for this set pretty much dictated the entire card! It is just perfection! Let's take a closer look at the new Rainbow High dies... you get a joined rainbow of 7 arches, an offset giant balloon, and 3 cute little clouds. Let's look at the the rainbow die cut in particular, they are cut as ONE PIECE, joined slightly together at the bottom of both ends, see photo below. This is intentional as there is no assembly and lining up to worry about. I found it so easy to use as I can just die cut the rainbow in white card stock once and color each piece separately. It's a whole lot easier than die-cutting it 7 times, each in different colored card stock then piecing them all together. Of course you can always trim the ends to separate them as well, then you would get 7 different pieces. We absolutely love the versatility and ease of use of this awesome new design! Love the stamp set! So adorable and the rainbow die is a must have. Darn cute creations! Who doesn't love rainbow and unicorns! Love the dimension on the rainbow, must have die! so cute! :D I mean who doesn't love unicorns?! Love the dies. Your stamps are always adorable so I've got my list of future wishes. Keep up the good work. I really love these! I'm obsessed with cute unicorn things! Pretty sure this is one of the cutest sets ever! Totally love it and really like the idea of the one piece rainbow die! So cute!!! I really can't wait to play with them! Adorable stamps, and loving the new dies!! I love unicorns and these are some amazing cards. Adorable cards!!!! 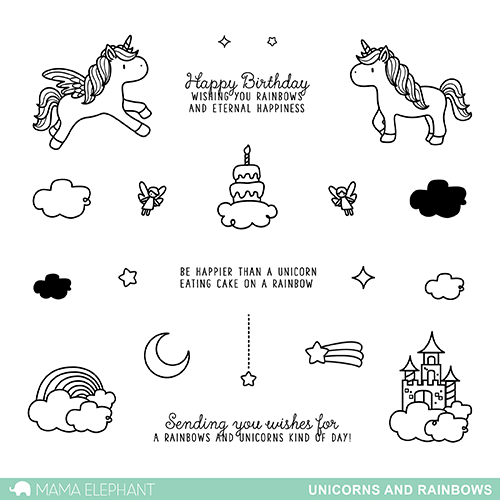 I love these unicorn stamps! Oh my goodness, this is a must have! My girls are going to love the unicorn stamp for sure.